The technology to record and produce your own music has been available to the masses for years now, and though I have found the results to be mixed, often times it turns out to be really great art that otherwise would not have made its way to my headphones. 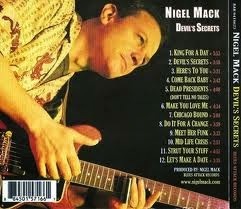 When scrolling through the seemingly endless list of independent CDs on my computer, Nigel Mack’s self-produced Devil’s Secret stands out as one of the gems. Nigel Mack (Mackenzie) is originally from Saskatoon, Canada, but in 1988 he relocated with his band to Vancouver, as it is a fantastic city with a thriving arts scene. But Professor Eddie Lusk hooked him up with the Chicago scene in the early 1990s, and he ended up touring across the United States for the next ten years. Finally, in 2003 he decided to call the Windy City his home. All twelve of the tracks on Devil’s Secrets are originals, and they were recorded in Vancouver and Chicago, with different musicians at each location -- I guess he never lost those Canadian connections! Besides assuming the roles of writer and producer, Nigel also took care of the vocal chores, as well as contributing harmonica, guitar and slide guitar parts. Working with two bands, two recording studios, a mixing studio in Nashville, and a guest artist that was recording in Texas must have been difficult, but this CD still turned out to be a nice piece of work. The first track up is “King for a Day,” and right away it is apparent how slick this album is. Though this is a blues-based song, there is almost a samba feel to the bass line, and the band is as tight as can be. Most notable is the Chicago-sourced horn section of Lise Gilly on sax, Johnny Cotton on trombone, and Victor Garcia on trumpet. Lise and Nigel did a top-notch job of arranging the horns and integrating them into the tune (and three others on this disc). 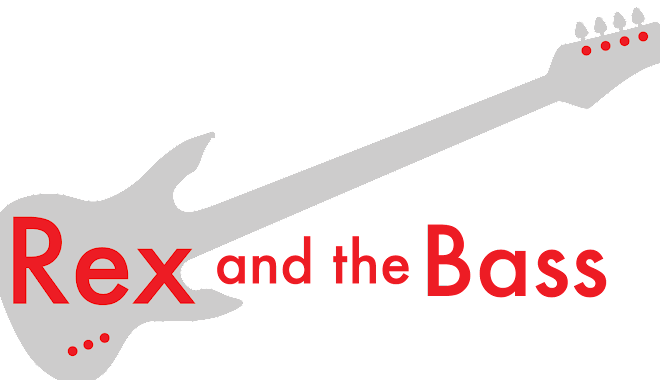 The title track is a more basic blues rocker. Things really get into the groove here, and this where I noticed Nigel’s strong voice. He imparts a touch of humor to its tone that fits in well with the clever lyrics of a man torn between right and wrong. Mack’s slide guitar is also very good and it contrasts nicely with the popping bass from Vic Jackson and the rich organ tones of Brian James. “Here’s to You” is a slow tempo number which features a return of the horn section and some nice lead guitar work from Nigel. This drinking-man’s ode to the love of his life is followed up by a Creole-tinged tune, “Come Back Baby.” This one is a treat as Mack switches over to harmonica and we get to hear some wonderful accordion work from guest artist CJ Chenier, straight out of the Lone Star State. I think I heard a little washboard in there too! There is plentiful word-twisting to “Dead Presidents (Don’t Tell No Tales)” as he details the woes of a man who finds out the hard way that it is better to not leave a paper trail when stepping out on his old lady. This is a classically constructed tune with a decidedly “Mustang Sally” vibe to the backline. By the way, this is the first of the three Vancouver tracks on Devil’s Secrets; I do not see any real difference in the recording or engineering between the different studios, so the progression of songs is seamless. “Chicago Bound” is a live recording from Pete’s Place in Chicago, and it turned out to not be the Jimmy Rogers version that I had been expecting. It is an original tune with Nigel masterfully playing a well-mic’d National steel guitar, stomping his foot and howling the vocals. This bare-bones blues song is a real gem, and I love that he snuck this one into the mix. Nigel shows a strong grasp of many different genres on Devil’s Secrets, and “Meet Her Funk” shows that he was paying attention during the 1970s. This Vancouver-based track features some first-rate horn playing from saxophonist Steve Eisen while David Webb tears thing up on the organ. There are at least three guitar parts in this one, and though Mack is credited for the vocals, I had to listen to it a few times before I realized there aren’t any words to be found. He snuck another instrumental in, and “Strut Your Stuff” has a driving Chicago blues feel to it and some astounding harmonica tone. Nigel trades his harp with some awesome guitar work from Todd Taylor and James Rogers. And finally, “Let’s Make a Date” leaves us with no doubt that those years on the road working with so many great artists honed his skills and gave him a solid understanding of the blues. 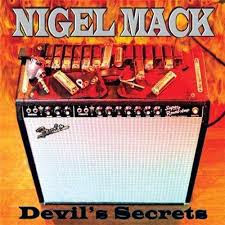 Devil’s Secrets is a very good album of original material, and this work proves that Nigel Mack is a force to be reckoned with. He has set the bar high with first-rate musicianship, writing, arranging and production; I expect great things from him for his next release. If you check out this album, you will become a believer too!